To celebrate the beautiful and talented Erika Jayne's fourth time atop the Billboard Hot Dance Club Play chart with single "Pretty Mess" I have 3 FABULOUS prize packs to give away. YAY! What's included in the prize pack? Let me tell you! *SIGH* Seriously? I was not-so-secretly hoping that we'd heard the last of Irish brothers, John & Edward Grimes (AKA Jedward) from X-Factor after they were dropped by Sony but sure enough, they were picked up by Universal the very next day. I'm all about having a laugh (and watching them do the 'Ghostbusters' theme song was HILARIOUS) but recording an album? Granted, I couldn't help but crack a smile watching the music video for their first single, "Under Pressure (Ice Ice Baby)" but I'm having trouble taking them seriously. They just seem like big goofballs that really don't have any vocal talent to speak of. "Under Pressure" was good stupid fun, but going and releasing a Top 6 Blink-182 hit from 2000 as their second single? 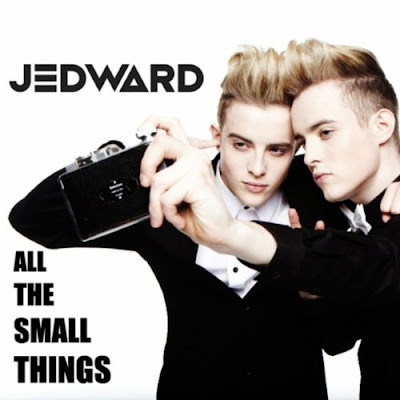 That just seems like a nightmare waiting to happen...granted "All The Small Things" did chart higher in the UK. STILL! I wonder what Blink-182 think about all this. The video for the song starts out like a home movie and goes nowhere fast, with the boys just "being themselves" in front of a variety of colorful backdrops, with different props and even in black & white. *YAWN* The single comes out today, July 18th and is the second to be lifted off of their debut album, Planet Jedward, due out on July 26th. It looks like we'll be seeing a lot more of Jedward in the coming months. I don't know how I missed this news, but apparently UK singer/songwriter Paloma Faith will be re-releasing her second (and highest charting) single as a remix featuring the Wu-Tang Clan's Ghostface Killah. Not quite sure about this decision. Sure, of the four singles released off of Do You Want The Truth of Something Beautiful?, "New York" was the highest charting, but why not wait until we have some new material? We already know, thanks to Twitter, that the next album is already in it's beginning stages. Do we really need a generic Urban remix of an already PERFECT pop song? Personally, I don't think so. I guess the good folks at Epic think otherwise. That's fine. I'll continue to support Faith, whom I think is too great a talent to let slip by the way side. Despite her debut album making the Top Ten, the highest charting single off the album only made it to #15. "Stone Cold Sober" made it to #17, followed by "New York," followed by the album's title track at #64 and finally with "Upside Down" which peaked at a dismal #55. Does Epic really think this remix is going to do anything on the charts? I'd love to be proven wrong. I really would...I'm just being realistic here. It sounds like Faith realizes what a tough industry she's in. In a March interview with Digital Spy, she acknowledges that she has to SELL records in order to avoid getting dropped by her label. "I think they'll keep me for this next album, but if I keep making losses for them of course they'll just drop me." A sad but true statement. Needless to say, I can't wait to see what her next album sounds like, but I fear that prospects of her coming here to the U.S. are slim to none. The Ghostface Killah remix of "New York" will be available in the UK on August 1st. Listen to the remix below. It's been over a year since Kaci Battaglia released her last single, "Crazy Possesive (I'll Muck You Up)" but the wait for a follow up is FINALLY over. "Body Shots," Kaci's second single off of her as yet untitled new studio album is a dirty, raunchy club smash, similar to "Patron Tequila" by The Paradiso Girls (who also waited FOREVER between singles) in that it's a song about drinking in a club. The single features Ludacris on token rap detail, which i actually think adds to the song here. This is one of those fun club tracks that doesn't really have much in the way of substance. I feel like with "Crazy Possessive" we at least had a story, where the girl was paranoid about her man cheating on her. With "Body Shots" what you hear is what you get. No hidden meaning, no deep insight into anything - it's about a pretty girl bringing all the boys to the yard and promising them rivers of booze flowing off of her hot body. With remixes by Dave Audé, Mig & Rizzo, Ray Roc & Gabe Ramos and WAWA it's likely going to be another #1 Club Hit for Battaglia, following "Crazy Possessive (I'll Muck You Up)"which went all the way to the top on the Billboard Hot Dance Club Play Chart. I actually think that Curb should release one of the remix edits as the single version. Nothing against the original version of the song but I think one of the remixes would take it up a notch or two. While I haven't heard the WAWA remixes yet (technical difficulties over on Masterbeat), the Audé and Mig & Rizzo mixes are quality. No word yet on when the single will be released, but seeing as the remixes are now available exclusively on Masterbeat, it can't be much longer, right? Listen to the original version (above) PLUS a couple of the remixes below and let me hear your thoughts. Battaglia has come a LONG way since her days of covering The Partridge Family's "I Think I Love You."